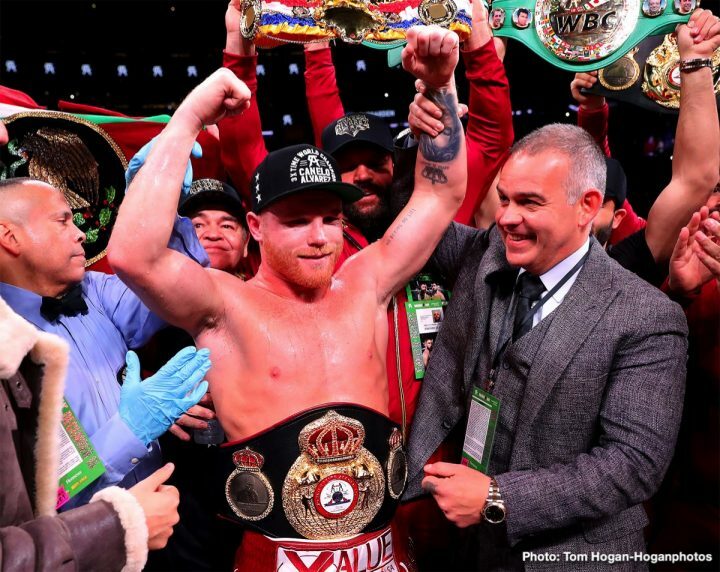 By Dan Ambrose: Saul Canelo Alvarez completely outclassed the hapless Rocky Fielding last Saturday night to win the WBA World super middleweight title at Madison Square Garden in New York. It took Canelo only three rounds to rip Fielding’s secondary WBA 168 title from him in dropping the horribly over-matched British fighter four times in the contest before the fight was stopped. Fielding took a knee 3 out of the 4 times he was dropped by Canelo. It looked bad in the sense of how noncompetitive the fight as. The fight that should have taken place last Saturday in the eyes of the fans is Canelo vs. Callum Smith instead of using Fielding as the opponent. Staying at 168 could be a risky move for Canelo’s career and legacy if he was forced to fight Callum Smith, who is the complete opposite of Fielding in terms of talent, boxing skills and punching power. It’s all around much tougher fight for Alvarez against Smith than it was in dealing with Fielding. Smith is a huge body puncher with either hand, and he would more than welcome an inside fight against Canelo. It wouldn’t be the mismatch on the inside like we saw last Saturday. It would be a fight where Canelo would be required to take as good as he gives against Callum, who is a monstrous puncher on the inside. The 6’3″ Callum is able to generate unreal power with his long frame for his body shots. It would be a different experience for Canelo, who would need to figure out how to move his upper body to avoid those shots. Against Gennady Golovkin, Canelo used a lot of head movement to avoid his head shots. Canelo wouldn’t be able to do that against Smith, as he’s a body puncher. That would make things a lot more difficult for him. Of course, if Canelo avoids Callum entirely, then he doesn’t need to worry one bit about how to avoid his body shots. Canelo can just swerve the Smith fight entirely, and his boxing fans won’t give him grief for failing to do so. We saw Floyd Mayweather Jr. win a title at junior middleweight without fighting the Charlo brothers, and that was viewed as a weak move on his part. Mayweather’s fans didn’t hold it against him. So it’s possible that there won’t be any fallout from Canelo taking on Fielding to win a world title at super middleweight without fighting the main WBA 168 lb champion Callum Smith. With the pressure that fans would put on him, Canelo could not stay at 168 without facing Smith. The boxing public would demand that he face him, as he’s the best at 168 in their minds. It was nice the way Canelo dispatched the hand-picked Fielding, but he was never seen as a good fighter that would trouble him or many other fighters from the 160 lb division if they wanted to fatten their legacy the easy way by beating a vulnerable champion at 168. In the aftermath of the fight, the boxing fans are now eager to see Canelo fight the true WBA super middleweight champion Callum Smith (25-0, 18 KOs) so that he can prove himself against the real champion at 169 Yes, the World Boxing Association has TWO champions with their organization at super middleweight. The upper champion is Callum Smith, and the lower level guy was Rocky Fielding (27-2, 15 KOs). It’s ridiculous for a sanctioning body to have more than one champion per weight class, but the WBA does things there own way. It’s like the NFL having two Super Bowl champions. It’s believed that Canelo’s fight at super middleweight was a one and done number, and that he will now be moving back down to middleweight division to defend his two titles against the likes of Daniel Jacobs. Canelo has never given anyone the impression that his fight move up to super middleweight was anything more than a one-shot deal in which he wanted to capture a third division world title, and then move back down to 160 to continue to fight in that weight class. Canelo wanted to do what few Mexican fighters have done in the past in becoming a three division world champion. Now that the 28-year-old Alvarez has accomplished his goal, he’s likely to return to his natural weight class at middleweight. Canelo’s promoters at Golden Boy Promotions have already scheduled his next fight for May 4 at the T-Mobile Arena in Las Vegas, Nevada. Although Canelo still hasn’t said that he’ll be returning to 160 pounds to defend his WBA and WBC middleweight titles, it’s thought that he will be. The choice for Canelo in what weight class he should campaign at is tougher for him now after the way that he dispatched Fielding. If Canelo doesn’t care whether a fight is for a world title or not, then it opens up a lot of different options for his next fight on May 4. Instead of Canelo fighting Callum smith and Daniel Jacobs on that date, it could be someone the boxing public would least expect him to fight like David Lemieux or Chris Eubank Jr. There is a little bit of pressure on Canelo to face a fighter that the boxing fans want to see him fight, whether he wants to admit or not. Canelo still has 10 fights to go of his 11-fight, 5-year, $365 million contract with DAZN. To bring in the most amount of subscriptions for DAZN, Canelo needs to fight opposition that the boxing public in the United States wants to see him fight. That means guys like Golovkin, Jermall Charlo, Callum Smith or Chris Eubank Jr. Canelo can’t just cherry-pick weak guys from 160 and 168 and expect the fans to gleefully pay $10 per month to subscribe to DAZN to watch him fight guys that aren’t in the same talent class as him. Canelo has to fight good opposition if he doesn’t want to hurt his career and bring in fewer subscriptions to DAZN. Golden Boy Promotions CEO Oscar De La Hoya was enthused with what he saw from Canelo in his move up to super middleweight against Fielding. De La Hoya sees Canelo as now having options at 160 and 168 that previously weren’t there for him. Canelo being able to fight at super middleweight could give him a safety valve to escape from potential risky fights that he might not be eager to take against Jermall Charlo, Demetrius Andrade, Daniel Jacobs and Golovkin. None of those fights would be easy ones for Canelo, and he could very well lose to all of those fighters. With Canelo’s showing at super middleweight, he can always bail on the 160 lb weight class if he feels that it’s simply not worth the risk for him to continue to fight in this division against the lions that are sharpening their claws looking to tear him apart. In moving up in weight to super middleweight, Canelo might be able to take advantage of the less talented fighters in that weight class. With the limited talent at 168, there’s no way of knowing how good fighters like Callum Smith, David Benavidez, Gilberto Ramirez, Jesse Hart, Chris Eubank Jr., George Groves and Jose Uzcategui are. Perhaps they’re not as good as Canelo, and will wind up being destroyed by him the way Fielding was. The only way we can find out for sure is if Canelo takes the risk of moving up to super middleweight. But you can bet that if Canelo does make the move up to 168, he’ll be followed almost immediately by Golovkin, Daniel Jacobs, Jermall Charlo, Billy Joe Saunders and Demetrius Andrade. Apart from Golovkin, those fighters are all more than big enough to be fighting at super middleweight already.